The Democratic Party of Japan has disappointed many of its supporters since coming to power a year-and-a-half ago. Some of the party’s most progressive proposals have either been shelved or abandoned. One of the less discussed promises has to do with chukai tesuryo, or “intermediary fees” that are charged by realtors when they broker a sale of a house by the owner. As with the pledge to support renters, the promise to control fees remains in limbo, and it’s not clear what exactly the DPJ hopes to bring about by limiting the fee to one party in a home sale. For sure, the extraneous fees that come with buying a home can be intimidating: title registration, bank fees for loans, loan insurance. In the end, a buyer pays anywhere between 5 and 10 percent of the price of the property in fees. In any case, no realtor charges less than the 3 percent ceiling, which means that the whole industry acts like a cartel. There’s no competition, though theoretically there could be. 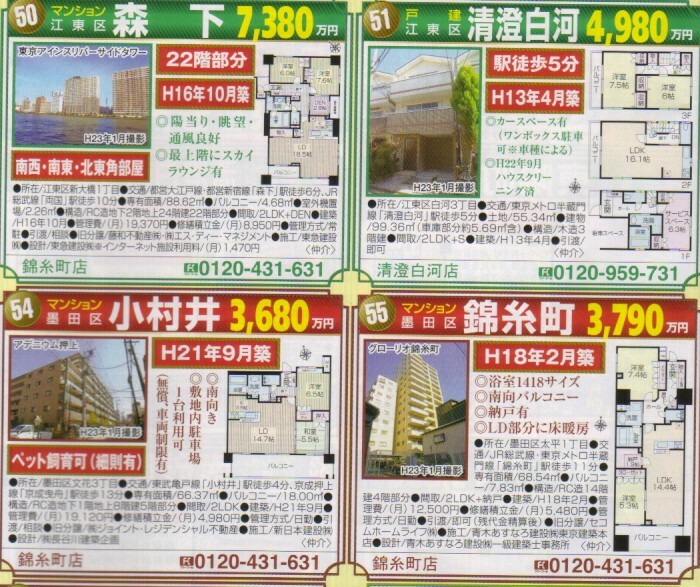 Most properties list with multiple real estate companies, so it’s possible a prospective buyer could play one against the other: Give me a deal on the tesuryo and I’ll work with you instead of the other guy.